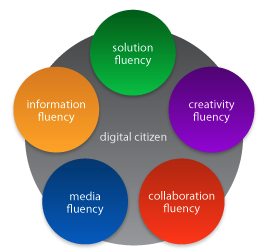 There are two distinct projects that focus on fluency for the 21st century. Both projects use the circle as a graphic representation of the fluency they advocate for. 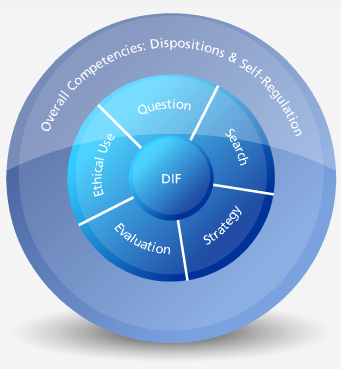 Within their “fluency” circle is a center surrounded by 5 sub divisions representing different aspects of their fluency project. This project is copyrighted by the infoSavvy Group, a consulting firm that does presentations, facilitations and workshops. Andrew Churches, the creator of the Digital Bloom Taxonomy is listed as one of their presenters. 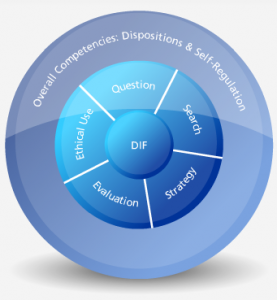 This fluency project focuses specifically on “digital information fluency” (DIF) and focuses on how to effectively and efficient find information using digital search tools. Started in 2001 at the Illinois Mathematics and Science Academy with funding from the US Department of Education, 21CIF became a business in 2009 generating income from online course fees, face to face workshop fees and product licensing. This entry was posted in Trends on May 31, 2010 by Alex Chapin. Is Fluency the New Literacy?